Dec 9th The first snowstorm on the area came this week and I went for groceries before it hit. It was -12 Celsius (10F) when I went back and the roads were covered with 10cm (4in) of snow. This is a rural setting with land along the roads. I’m new to the area and still don’t know the roads very well so suddenly by the driveway on a curve it became steep and bumpy because I slightly got off the road. The car moved a bit while I turned the wheel back to the pavement and in 3 seconds I was stable on the road again. I felt when the tires gripped the ground and pulled the car back. 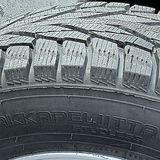 Nokian R2 SUV tires gave me confidence over an unknown situation and I realized these tires are really awesome and reliable. I felt like nothing happened.